ARCAS’s Guatemala City office is home to its Environmental Education Department and is where most of its administrative, fundraising and networking activities are carried out. 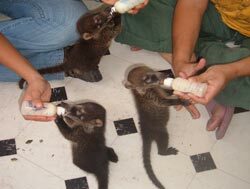 It also serves as a temporary holding center are for rescued animals on their way to Petén or Hawaii. 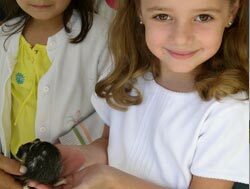 The ARCAS Environmental Education Department carries out presentations at schools and organizes environmental fairs and other activities in the Guatemala City area and throughout the country. 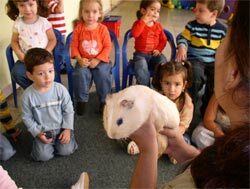 It uses live, non-releasable animals, puppets and other props to engage students in a fun, participatory manner, always conveying its principal message: don’t buy wild animals as pets!. Thanks to the Columbus and Brevard County Zoos for the development of many of these educational materials. The Guatemala City office is also ARCAS’s base of activities in support of the 5000 hectare Cordillera de Alux Watershed Protection Area, the largest protected area in the metropolitan region and a very important freshwater catchment area for a city that is already suffering from serious water shortages. ARCAS works together with the Municipality of San Lucas to manage the Senderos de Alux Ecological park, a 66 acre reserve of highland pine-oak forests on the outskirts of Guatemala City. There, it is in charge of educational activities, and with the help of the government’s FONACON fund has constructed interpretive trails, exhibitions, amphitheatres, and a small natural history museum.